It’s been a while Noragami is sitting in my queue on Crunchyroll, after finishing watching Trigun I thoughts it would be time for me to watch it. I heard a lot of good thing about it and it make me curious, plus Yato seems to be adorable. He not only seems adorable, he is adorable, I really wonder why I haven’t watch it sooner. 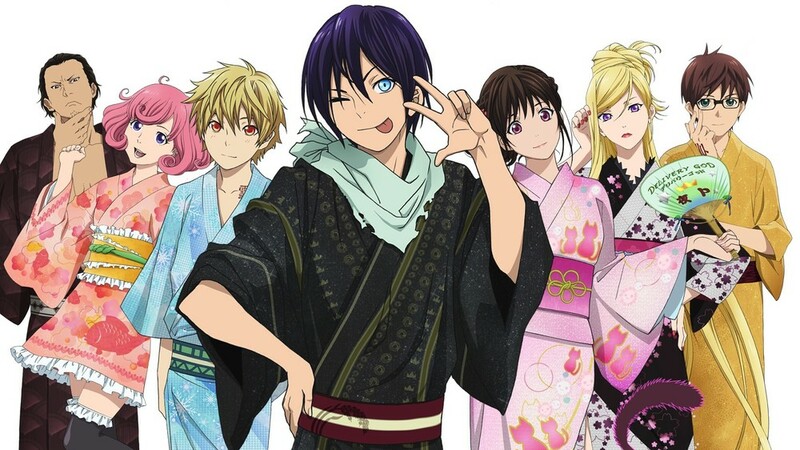 I always liked supernatural series and Noragami is one of those that I instantly like mostly cause of the character. We follow the story of Yato, a god of calamity, who wish to gain enough worshiper to have his own shrine. Of course being a minor and unknown deity have a lot of down side, one of them is losing his Regalia (weapon a god use to kill phantom) cause the latter want a better live. Without Regalia he can’t fight so he end up granting random wish and become a sort of handyman. Yato can be really greedy, but as a god he doesn’t want to ask more than 5 Yen per wishes. Century ago he was a fierce deity who only purpose was to kill, but now he care a lot about the people who surround him. He could have stay the god of calamity that he was and continue to grant deadly wish, but he decide to change when if for that he probably lost a lot of worshiper. One day Yato cross the path of Hiyori, the good was runnning after a cat and right before he get hit by a truck, Hiyori pushed him and get hit at his place. She should have died but Yato bein a cinnamon bun decide to give her back her life…sort of, now Hiyori is leaving between the two world, once in a while her soul slip out of her body. She can’t be really annoying, she doesn’t always fully understand the situation but she have a sweet side that make me like her really much. Of course like all series of that kind, a villain need to be seen somewhere. In this series the main antagonist is an other god of Calamity, Rabo, who only wish to fight the fearful Yato, not matter what it cost. As I said, I mostly enjoyed this series cause of the character, it have a nice story, and a lot of good fighting scene, the one between Yato and Rabo are particularly great. Even if the show is not labeled as comedy, it still of a good dose of humor in it. I haven’t watch the second season yet, I will eventually come to it. I would recommend the show to anyone who like supernatural series with great fighting scene. Noragami is fantastic. It’s funny, full of action, and its got so much heart. I just love the characters. Definitely one to recommend and I’m glad you enjoyed watching it. I really enjoyed it!! Yukine is so precious.